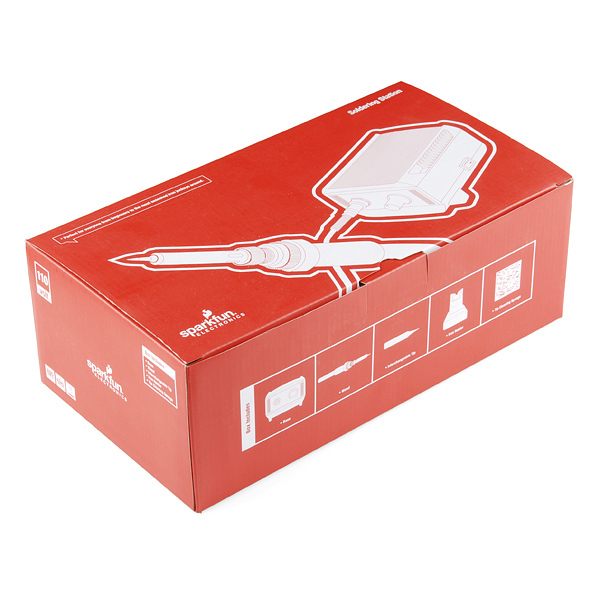 We know you've always dreamed of having a SparkFun branded soldering iron. And here at SparkFun, we are all about making wishes come true. This is a great step up from the basic soldering stations from Radio Shack or wherever you picked up a cheap iron because your last one broke right in the middle of a project. Unit includes 110V base station, iron, iron holder, and brass sponge. We can't say enough good things about this iron - set the iron temp to 350C and forget it. It's the iron that we recommend to our friends who've been bitten by the electronics bug. It's just a workhorse! The unit takes around 20 seconds to heat up. We are now shipping the irons with a brass sponge so you don't have to wet anything. Just wipe the tip across the brass sponge and you're good to go! The red LED on the front will be constantly on while the iron is heating up. Then the LED will start to pulse slowly (on for around three seconds, off for around three seconds, repeat). This LED indicates that the iron has reached and is maintaining a constant temperature (also called a control loop or feedback loop). The efficiency of the heat transferred from the tip to the joint is dependent on the the size of the soldering iron tip that you are using. Usually, you want to have a soldering tip that is about the same width as the soldering pad you are soldering to. For more information, check out this article by Hakko. We do have a replacement! 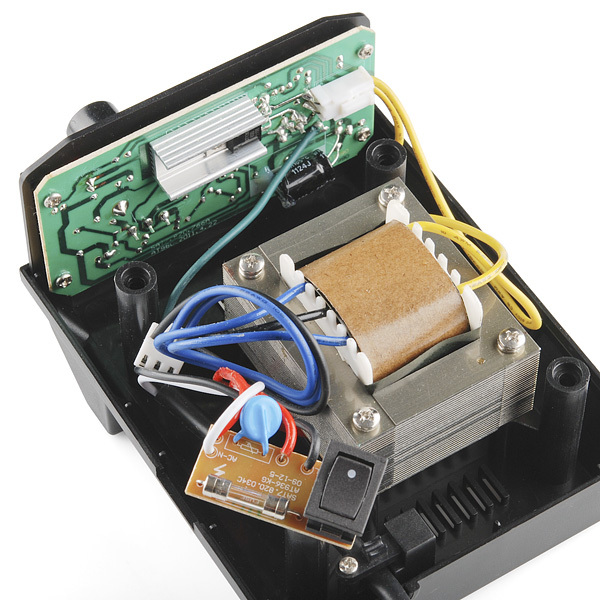 Have a look at the Hakko FX888D Soldering Station. It's even better than the 937b. Also don't forget this Weller Station. Hey. So, I purchased one of these back in 2012. It seemed to work fine for a while, but the center black plastic nut on the soldering wand would often slip a thread whenever I used a little pressure on the tip. Leaving me to tighten a hot iron every so often. Till finally it wouldn't stay tight at all and the spring underneath would push it right back off. leaving me with a useless iron for a couple years. I recently had some soldering work to do and went looking for a replacement wand on Ebay. While looking I found one seller offering just the 3 end pieces for sale for just a couple bucks from Hong Kong. (currently $1.83 shipped for 2!) Long story short, it fit perfectly and was a very cheap fix! Two things... first the listing doesn't mention the 937B as there are several models that all use mostly the same design and parts and it does fit. Second, there are also sellers with 'adapter' ends, for adding a different size tip, which you also (probably) don't want. Just search for "handle accessories 937D", from seller "fat-mango". Needless to say, I've been pretty happy with this fix, even though I've only used it for one session so far. There are several other sellers with apparently the same thing and they'll all probably work... but I can only verify the one from the seller I mentioned above. This may be obvious to some people, but until I spotted this item in one of my searches for a replacement wand, I had no idea you could get just the few end pieces for just a couple bucks. Good Luck. I've been using this soldering station for quite a while and like it, but the plastic pen just broke in half on me. It broke right at the threaded part just below the hot bits. I see that this is discontinued, but is a replacement pen available either here or elsewhere by any chance? You ever figure it out? It's just an Atten 937b that Sparkfun rebadged (and which is itself a clone of the Hakko, but with different irons.) Just search for Atten 907 iron (AT907). NOW BE CAREFUL HERE! The original Hakko only uses 5 pins. The Atten 937b uses 7 pins on the connector. Ebay sellers often seems to list them as if they're interchangeable, but without some work, they're not (I think.) For more details, look down a few pages to laserhawk64 comment on the iron. As far as it goes, you're not the only one that's had problems with the wand. Like someone else mentioned in the reviews (after I bought mine), the plastic nut is a poor match and start slipping easily, which means then any pressure on the tip focuses on the unsupported ceramic element. do you plan to sell a 220V version ? We really don't plan to but it's good to hear you're interested. The shipping is just so expensive from us to you that it doesn't make sense to ship them across the world. I'll think on it and try to figure out a way. Yeah there is a world out there which is interested. I hope you are thinking on it.. So interested. Please make a 220V version of this. The 936 is about 100 U$S here, and it doesn't have the sparkfun logo! Getting it from you (including shipping) is actually cheaper than getting it here. +1 to get them in 220V. Directly shipping from china, it won't be that expensive. I would also be interested although I suspect they weight quite a bit so shipping might be an issue. Bought this recently and had a chance to use it for about a month on a pretty frequent basis. So here's my review! Overall this is a great product, and I'm very happy with it! It heats up fast and the price:quality is great. I expect it to work very reliably for the foreseeable future. Now that that's out of the way there are a couple things which could be fixed; by no means should these dissuade you from buying this product but you should be aware of them before your purchase. The brass-coloured cover for the brass sponge doesn't stick in the cavity and always pops out. (A little bit of electrical tape sorted that out pretty quickly). The tip that comes with the iron is quite fine... too fine for a noob like me anyway. I took the recommendation of one of the other commenter's and bought the Hakko T18 tip with the iron which works great for me. (I did try the other tip first for comparisons sake). The holder doesn't hold the iron perfectly, it kind of falls out a bit causing the iron tip to come quite close the rear wall of the holder, mostly cosmetic as it doesn't actually touch but it could cause that spot on the holder to get quite hot. (The issue seems to be that the 'comfort grip' overlaps the plastic bit that threads the tip to the handle so the iron doesn't seat completely into the holder. If you pull the comfort grip off it seats perfectly into the holder. I think I might be able to fix this later on with a small spacer of some kind or by trimming off a little bit of the grip. If there was maybe 2mm/2.5mm more of that plastic went uncovered by the comfort grip it would seat properly in the holder). The plastic used for the 'comfort grip', is cheap feeling. But that's cosmetic as functionally there are no problems with it. The metallic connector and ring for where the wand plugs into the base is quite thin and cheap... but in no way effects the reliability or stability of the connection. To sum up: This might sound really critical, but I'm actually really happy with this purchase and totally recommend it to any hobbyists like myself. It's still a great deal for the money! I too agree with "north' of skepty" and the replies others have written. This is an excellent workstation and the price makes it an amazing value. This unit would still be a great value at double the price. My only disappointment with this purchase. my "buyer's remorse" moment, was having to pay $2.00 more for the privilege of driving to the east side of town to pick it myself. Boulder already has a very high tax rate, 8.21% or about 5% higher by comparison to neighboring cities, and this additional "pickup TAX" was simply unjustified. Essentially I paid $2.00 to have someone walk the package from the back of the building to the front. Yeah maybe I harp too much about this $2.00 fee but assessing the web site and the location one can assume this company has streamlined, automated or outsourced nearly every aspect of the business. Those three things should help cut costs, increase profits and save the consumers money by keeping prices low. This added fee is the only thing that keeps me from saying "WOW! I'm impressed." I will recommend this company to my friends and business associates locally with this one caveat delivered with a disappointing inflection. As for the 5 points made by "north' of skepty", I agree with point #1 completely. A little bit of electrical tape easily and sufficiently corrects this one minor issue. Point #2 was the reason I bought this model, the fine point tip is a delight for me. Point #3 is correct in description but this holder is different than most. Generally I see holders that look like a spring and are cone shaped round to accommodate the tool. This holder has an opening at the top allowing for easy removal. More importantly for me it allows for easy replacement to the holder by feel instead of aiming. I very much appreciate this holder for that reason alone. Point #4 is probably why "north' of skepty" called his own review really critical. I find the grip to be very nice. it is plastic with a slight textured feel, but there is nothing cheap feeling about any part in this product. By comparison to other soldering irons which can get hot in the grip area after prolong use, this grip could very well be perceived as a luxury add on. I for one impressed by this grip. Point #5 I completely disagree with as well. This connector was one of the first things I inspected as a result of the reviewers comments. thinking I might want to do something proactive such as use some Loctite or otherwise to secure. Quite frankly I find this part of the unit more than satisfactory and of moderate to high quality. It threads easily and I appreciate the round textured feel of the steel versus the hex nut generally found in use with this type of connection. Kudos to the engineer who considered this small and otherwise insignificant detail and modified it for the end users pleasure. Thanks for reading. As both reviewers have stated...don't hesitate to buy this item, even if its overkill for your application, this is the type of tool you'll want to keep and pass down. 1950's quality for the 21st Century. This company is making them like they use too. Quality you can count on and craftsmanship rarely seen anymore. I agree with this review (had the iron only short time). I do love the soldering iron, don't be discouraged to buy. This tip really is nice, I did not get a different one but I do like the current one so I don't know if I will. This is quite noticeable with placing it in on if bumped on the desk. Nothing to worry about, the metal ring prevents the tip from hitting any of the walls or the iron from falling out. I agree with his solution too. Don't really notice the cheapness of it, maybe that is just me. The ring seems small I do agree, but I feel it perfectly does its job (as long as you aren't trying to tear the thing apart on purpose; the connection also does seem quite solid even before fastening the ring, so I am happy. I love this soldering iron and cannot repeat it enough; the solderer I had before this was a "gun style" solderer which was my dad's from the 70's (or something like that). This new solderer is an amazing replacement. (This was the first item on my list for the free shipping Cyber Monday) Do buy! I just purchased this station and I am thinking of buying another tip for the iron. Did you have any problems with the Hakko T18 on this iron? I read your review prior to buying. It's spot on...Thanks! I'm really happy with this iron. The fit of the iron into the holder doesn't inspire confidence, but it hasn't been a problem. The sponge holder on mine seems to stay put on its own. I did opt for the Hakko TD18-B tip https://www.sparkfun.com/products/10721 as well. It's perfect for the type of work I've been doing, including lots of de-soldering, recently. Hi, when do you anticipate restocking? AAAAARRRRRRRRGGGGGGHHHHHHHH!!! NOW you put in a brass sponge. 2 months after I got one. If I have the extra money, should I get the Hakko FX888D .. or should I just get this? I'm wondering if the Hakko is worth the extra $55. A similar question has been asked a couple of times below, but seemingly went without an answer. When will this be back in stock? Any news? I desperately need a new iron, and don't really want to get the "radioshack firestarter" again.. I swear it's nothing but a logo. That and this new iron comes in a snarky red box. And we included a free puppy with it and a lotto ticket. But you don't really need those, right? Is there a way to get a replacement iron? Not just the heating element or the tip, but the entire part that connects to the base station. Is there is replacement iron that will work with this station? I fixed the sponge holder cover issue by bending the tangs of the cover that fit down in the base parallel so the cover sits in the base with no "spring"- you know, where it wants to squeeze out. Then get a spring-loaded center punch or one you need a hammer for, and set one "dimple" at the center of each tang, from the inside out. This dimple will provide the friction fit needed to hold the cover in place. No ugly tape needed and its easy to pop the cover off for cleaning or sponge replacement. Enjoy your iron- I love mine! I've got the predecessor to this iron - the one that was on clearance for $29.95. Do you still carry replacement tips for that one, and if not, do you know who does? This thing is awesome! It heats up fast(think watching it time) and works as advertised. I can solder stuff in 1/4 the time that it took with my old cheapo from some shack store around town. Just got mine after a long back-order wait, works great. I was wondering if anyone with the new version w/ the brass sponge had a way to keep their cover wedged down in the iron stand, mine has a tendency to pop up. I'm currently using duct tape. I think I might try to make some sort of set screw when I have time. Let me know if you come up with something better! A single drop of super glue on each side of the cover has been working quite well for me. If it needs to be removed you can use a razor blade to break those spots free. Any idea when these will be back in stock? It's the only item I'm waiting for to place my order. Any idea when these may be back in stock? Does this work well with lead-free solder (http://www.sparkfun.com/products/10243)? If so, what temperature should I set it to? And do the tips in the related products all work well with this iron and the old one? Hi! This iron does work well at 350C for our lead free solder. Give it a try and adjust as you solder. You might be soldering on a big hunk of ground pour that may need a bit more heat. I'll double check to make sure the right tips are related. I don't think the Hako tips work but Robert will know. Hopefully they are making a digital version. Even the resistance measurements are the same as in the Hakko 937 manual -- approx. 2-3 ohms for heater, approx. 50 ohms for sensor, almost no resistance for ESD. The ATTEN 907 handle is a 936 handle with a different connector. It is electrically no different. If you are looking for a replacement controller, as I am (this iron, at least in my presence, chews through wands/handles a bit fast --I'm on my third-- and is having some temperature control issues, and is well out of warranty to boot) -- the eBay controllers with the title "Soldering Iron Station Temperature Controller For HAKKO 936 T12 T1 T13 Handle" will work fine. You will of course have to wire up your own connector, but you have to do that anyways. They're about us$20 from China or Hong Kong. Wire up eg an old Dell power brick (the Dell PA-6 series is perfect for this, ~70w output at 20VDC) and you've got yourself a dandy new iron! Retired!? I was waiting for it to come back in stock so I could purchase one! Will you be offering a similar station in the near future? I missed out on this by hours today before you ran out. When will it be back!?! Best iron ever at a very good price. Agree with others who were disappointed by the brass sponge cover: fixed it with 4 machine screws, one at each corner. Can't believe the manufacturer didn't notice and correct this shortcoming. Any idea where I might get a replacement tip for this? I like the really fine tip it came with but the tip on my broke a while back so its pretty hard to do fine pitch IC's with a blunt tip. I left this unit on overnight and now it wont melt any solder however the LED still indicates that it reaches the adjusted temperature... Is my tip heat treated/oxidized and no longer capable of conducting heat efficiently? Or do I need to track down a new element? Tip exterior is clean and will not tin. Some Weller brand tip cleaner got a another soldering iron working again, when this happened to me. What is the tip diameter? Got this station today and it heated up to 350C in about 4 seconds. I thought I misread the manual when it said it'd start blinking when it reached temp. Great iron, look forward to giving it a lot of work. Wish the stand was a little better. Iron handle doesn't fit in it very securely and the brass sponge/orange cover don't fasten down so it jumps around a bit when using, but nothing a little tape or super glue can't solve. Thanks Sparkfun! Do you sell spare parts for this product? What about the heating element? If not, is that part (or the entire wand) compatible with a Hakko spare? I'm sorry to hear about your problems. Email techsupport@SparkFun.com and we'll see how we can help. I've been using this for over a year now and it gets a lot of use. I was pretty skeptical that at this price it wouldn't be too great of an iron, but it was a lot better than I thought. For sure this is no super high end soldering station, it's built to a price, a price that hobbyists can afford without breaking the bank but I have had no problem using it for all sorts of work. The Good: Surface Mount down to 0805 so far- I've used this for small surface mount work. I've done 0805 components no problem and have also hand soldered multiple ATMega328s and ATMega2560s using the included super fine tip. Through-Hole - I also do through hole work with this soldering iron, I use the larger Hakko 'chisel' tip for anything that's not an SMD. Lot's of standard sized components have been across the tip and it's never a problem. Big Connectors - I fly electric R/C stuff. I have used this to solder Deans, XT-60 and barrel connectors with no problem at all. The Hakko chisel tip retains enough heat to make a quick solder joint without melting the connector housing. Stripping PCBs - I also use this thing to strip parts out of printed circuit boards (mostly switch mode power supplies with big caps, coils, wires, resistors, heatsinks, etc). I use the chisel tip and never have any problem removing 10 gauge wire, heat sinks, etc. Though I usually find adding a little fresh solder helps to remove some stubborn parts. Component longevity - Both tips have seen quite a bit of use but are still in good condition and hold their tin without spottiness. Even with reaching some high temps while stripping PCBs or soldering large connectors hasn't ruined the stock tip or the Hakko chisel tip. The Bad: The sleeve that holds the tip on tends to loosen up once the iron first heats up after changing the tip, you just need to tighten it while it's hot. That bronze colored cover over the mesh tip cleaner is pretty cheesy as others have mentioned, it doesn't stay in well, but it stays in 'good enough'. I think if the cover was designed to 'snap' into a couple of grooves on either side it'd be nice. It's not tiny, but it's not the most comfortable iron to hold either. My fingers tend to cramp up during long sessions, it'd be nice if they had a sleeve for it that would make it quite a bit thicker to hold onto. It's easy enough to wrap something on though. Summarized: I love it, I would buy one again and recommend on to other people and will never deal with another standard wall plug iron again. Note: I only use this with leaded solders and solder pastes. I've not used it with unleaded solders or solder pastes. Unfortunately, today when I wanted to change the tip out, when I took the tip off the ceramic heating element crumbled and a bit fell off. Does Sparkfun offer any replacement options for the wand? Or can you point me in the direction of one? when will this be back in stock?? 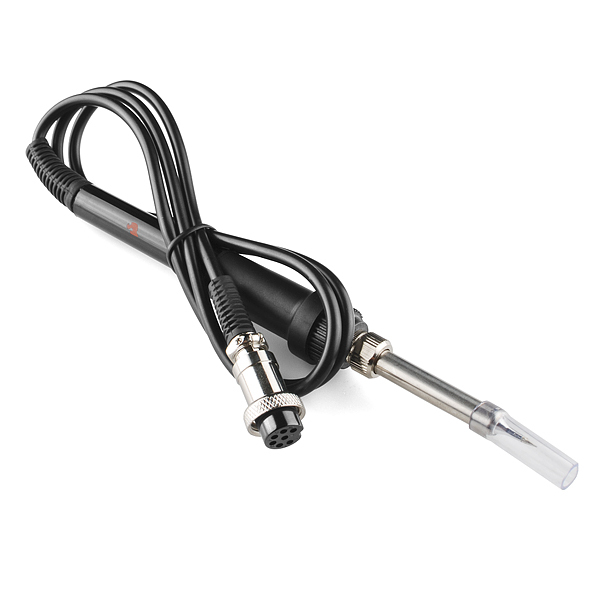 my last soldering iron (a cheap radioshack one) suicidally melted it's own power cable :( ;) and I want to get a good (this) one this time :) . Hi there. Is it possible to buy a replacement for the tip/wire/plug part of this iron? My students managed to demolish this part. Monsters, all of them. I thought I was pretty bad at soldering. Then I got this iron, the Hakko T18-D16 tip, the Sparkfun "special blend" solder, and a third hand tool. Suddenly I'm a genius. Sometimes the right tool is so right that anything cheaper is a waste of money. Are all Hakko tips compatible with this iron? If not what are the tips that will work with this unit? My first good soldering iron; I believe it's the ATTEN 900M-T-SI tip. Sorry to hear you ran into this problem. Give techsupport@sparkfun a shout and they should be able to help you out. Iron is a bit flimsy -- after only using this 4-5 times, the plastic connector on it snapped where you connect the tip with the iron -- it looks like just due to bad plastic. Sparkfun, to their credit, is sending a replacement. I guess I shouldn't expect more at this price, but was a bit disappointed on the build quality of the part. This was just soldering connectors, no pressure on the tip, or anything. Might have been a manufacturing defect/fluke with that particular iron. Temperature output is great, for rosin core (regular, lead) solder, and seems to work well. Although advertised as lead-free capable, I have had little to no success with the lead-free solder sold at Sparkfun and this iron. It seems like the iron is just not hot enough to get the lead-free solder to melt without first frying the contact/electronic component/board. Switching to normal, leaded solder eliminated all the problem. This could be my poor, rusty soldering technique (grew up in the leaded solder era on Weller soldering irons), but I wouldn't recommend it with lead-free solder. Painless with normal rosin core, completely frustrating with lead-free solder. Heats up fast, for sure. Much better than any other cheap soldering iron I've seen at this price, despite issue #1. Have tossed other irons at this price point which failed to get to temperature or maintain temperature. regarding #3, as someone who's soldered a few (thousand) boards, it works well, but lead-free is always a bit trickier. Getting really frustrated with this unit. The plastic threads on the collar really don't seem to grip well. Even a light pressure will cause the tip to pop loose. This only happens of course, when you're using it, so you have to wait to cool back down to fix it. Same issue here, and then the plastic collar broke (see comment below). please contact techsupport@sparkfun.com. we don't want you to be unhappy. Are you freaking kidding me? I'm no expert or master, but dang this station is GREAT! I've only ever used standard "wand" style irons without any temp control. This SparkFun station is amazing: heats up super fast, very consistent heat, amazing flow and easy welds. I added a T18-T16 chisel tip on the recommendation from my friend and it really helps this iron shine on through-hole work. I have only completed maybe 10 projects in my lifetime and I already want to go back and re-do the first 9 just to be happy with my soldering and finish. Tested this station last night building a small portable single opamp 9V riaa phono-stage, completed in under 3 hours with the help from SparkFun's excellent soldering station. Do you guys sell the hand held part only? I cracked the ceramic element while trying to force a hakko tip (from here) onto it, apparently the inner diameter of some tips is slightly smaller than the ceramic element...?? TOL-1071 had a comment that it will work as a replacement tip is this true? so after buying a radio shack mid range model my only question is... Replacement tips? I will order one and 2 tips if they are available. please respond before Friday 5 pm. i looked but i don't see. What tips does this iron take? Other users here report using the Hakko tips with no problems. What size is the tip? This needs to be back in stock, now! Which tips does this soldering station accept? Is it a standard size? When do you expect to have more in stock? I've been using this iron for about a year, with a very fine tip for PTH work and a wider, flat tip for SMT work. I've been upgrading various tools lately, so I'm curious what the advantages are of the more expensive Hakko or Weller units? Do they heat up faster or maintain their heat more accurately? Are they just better made? What are the soldering tips options available for the TOL-10707 soldering iron besides the 900M tip? +1 for 230V & Schoku Plug Version. After using my iron on and off for a few months, its started to make buzzing noises during its on - off cycle. My guess is that there is an intermittent connection in the temp sensor from the cable. What do you guys think? what should I do? I recently purchased one of these and the plastic that holds the circuit board onto the actual iron itself melted away on only half temperature. What should I do? Mine also got loose and melted, but I've had it over a year. Can I buy just a replacement iron and cord to replace the melted unit but keep the base I have? do you sell any other tips for this iron??? I would like to order this iron,but would think twice if you only offer one tip. Customers have used the Hakko soldering tips and is compatible with the soldering wands for this station. Just look below at the "Related Products: Selected by our Staff" section. Well after using my fathers soldering iron for the past 8 years... he got a real job again, so he needs it back. nothing can compete with his. in less than 5 seconds i can be soldering after turning it on. the tips never ware out. (even when i didnt tin them or take any care of them). how does this one compare? Besides footprint, how is this different than the Hakko FX888 that you sell? From what it seems, they are both based off the same design. Great little iron, but if you turn the heat up to 800, the handle will melt and the shaft will come off. Its a great for its price, maybe dial back the heat dials max temp to somewhere that will not self destruct the wand. Um this is the temp of a soldering iron not the speed of your car. Yes you may have a fast car in all, but, this is circuits not a dealership and we don't care much about cars unless it's us nerds wanting a hybrid. When my Weller solder station took a crap on me I needed a quick fix for cheap. I purchased this product with the anticipation of not liking it as much as my Weller. I was pleasantly surprised! This little guy rocks! I'd buy it again, and will likely gift a couple at christmas time. My only complaint is the iron holder. It's almost as if the diameter of the holder is too small or not deep enough, as it doesn't hold the iron firmly. For $40, though, you can't go wrong with this. 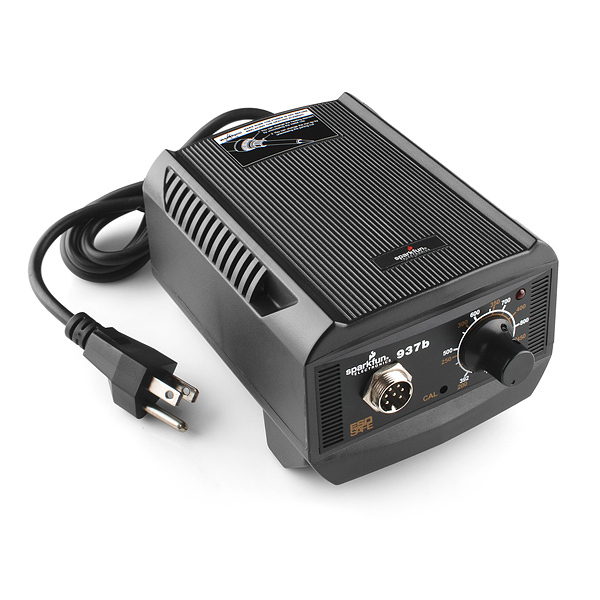 Question about your : Soldering Iron Variable Temperature 50W ( TOL-10707 ) maybe an option to do a version without transformer, then user's wanting 220v version could install there own, even an external transformer ?, this would keep weight down on postage and sell more for yourselves, i definitely would be interested in this version. This i did with your hot air workstation which works like a charm, if you made a version with ??V ? ?A voltage of transformer for external power pack. hi, i'm a teacher, and i bought this iron for one of my beginning students (11 years old). i gotta say, i'm pretty disappointed. it gets the job done, but right out of the box the tip heats unevenly, the iron doesn't sit well in the holder, and the cord is painfully short. i like sparkfun and buy all the components of my new student "starter kits" from sparkfun anytime i'm teaching a new pupil, but this iron really doesn't seem any better than the old red weller that i learned how to solder on. out of stock yesterday, in stock today!!! Can you use Hakko heating elements in these? If not, where do you get heating elements? *edit I've used this iron for nearly 6 months now. Heavy, daily use. I'm still using the same tip that I started with and there are no signs of wear and no signs that I'll ever need to use the two replacement tips I bought. My temp is nearly always set on 750F and, except for occasional clumsiness, I've never had an issue with heat. In fact, even after soldering for 30-60 minutes, it's still perfectly comfortable to handle. The only thing I'll say about this is that the sponge and sponge cover are no good for heavy use; best just to buy a brass sponge and ditch the one this iron comes with. But otherwise, this iron is perfect. Please make the choice for 220V to 240V AC input, pleeeease !!! @Bigbrother. Have you had any luck finding repl elements & pens? I can find them hit & miss on ebay but I would like to find them from a more dependable source. sigh It seems like this soldering iron is always out of stock! Just received mine. The cover on the brass sponge is not held in place in any way. I tried to use the brass sponge, but pressing lightly on it makes the cover lift off and rest on the iron as the sponge rolls back. It would be a minor annoyance except I will need to do this like 100 times per project. Just wondering if I have it seated wrong or if it requires duct tape? If I try to bend the cover even slightly the gold paint starts to crack. Any one else solve this? See my solution to this problem below. No tape needed! I had the same problem, so I think it's an issue with all of the soldering stations. A strip of tape (duct tape, or I used reinforced tape) should hold it on there just fine. In my mind, it's a small price to pay for having a brass sponge, which is definitely a huge step up from the old wet sponge style of tip maintenance. the manual advise to olny use ATTEN spare products. 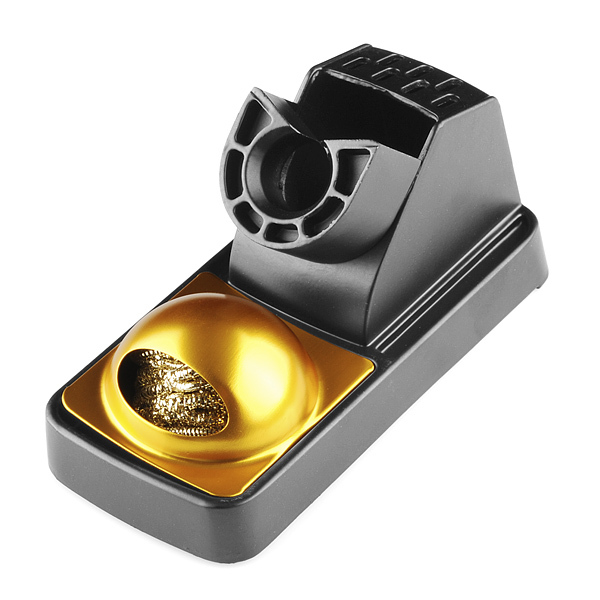 Is there a way for those of us who purchased the previous model to procure the metal shroud that you use over the brass sponge now? I have the version right before this and wouldn't mind owning the cover as well. oh , and a better picture of the tip please . around what range of price are we talking here for EU ? i want one so bad , and can t find anything serious in france , all the websites are crap , and you don t know what you re buying . Give me your price SPARKFUN ! do you sell the cover for the sponge like the picture? I have the old version of this iron and the sponge but not cover thingy and it looks neat in the picture compared to what mine looks like now. Can i plug this strait into a english wall socket?, ill clip of the old plug and put an english one on there. NO! england runs on 110v more than this thing is rated for. any idea when this will be restocked? I ordered it when my radio shack digital iron started acting funny. hi, Im 4m India, over here the wall socket's voltage rating is 240V, so what happens if i do get this one and plug it in directly to the wall socket..?!?! You need a voltage converter. They're not expensive. The Hakko tips work great with this iron, and yes, the included tip is perfect for through hole soldering. Who is the maker of this soldering iron? I always thought this was an Aoyue iron, but apparently it's an ATTEN 937B. It's basically a Chinese Hakko compatible/knock-off iron. Sounds kinda gross when you put it that way, but I've read here and on a couple of sites (ones I visited trying to find info about it) that it's a pretty solid iron. Also, I know it's only been a few days, but when is the estimate for this coming back in stock? I plan on getting one, along with some other soldering and electronics supplies. Yeah, I'm dying to spend my free day money on this. Its been on back order in my cart for a week and a half. Thanks for the info on the iron. Great researching. How long is the cord from the base to the wand? Not including the connector or stress relief parts, mine measures 33". It works nicely, I'm very happy with my new one. Is the tip supposed to be so loose? The parts are like this: The tip fits over the white ceramic heater and there is a tube that's rounded inward on the outside end and flared out on the inside end. A knurled, threaded collar fits over the tube and screws to the handle, holding the tube which in turn holds the tip. But the collar runs out of thread before the assembly is tight. I can't really use a soldering iron where the tip end flops laterally by 1/8" of an inch. Should I make a spacer to go into the threaded collar so that it squeezes the assembly? Is there some reason, like thermal expansion for this looseness? It looks like the threaded collar is fine, as is the handle threads but the tube is too long. Maybe I should cut 1/16 off it and try to reflare the inward end? The threaded collar should compress everything nicely when the unit is cold. The tip shouldn't move at all. Perhaps something is not lining up. If you still have problems don't hesitate to contact us and we'll get you fixed up. For me, the 900M tip that ships with the unit (I have the newer one) tightens down fine. But when I bought a T18-D16 Hakko tip and tried it out, the tip is .5mm too short, and doesn't completely touch the metal sleeve that houses the ceramic element, so it is floppy, like you were saying. I think that the 900M series Hakko tips might fit better, especially since Sparkfun is calling their's a 900M tip. Toss the sponge it comes with and get This You'll never go back to wet sponges! I second that. Wet sponges do their job but brass sponges have the benefit of never having me become lazy and not wet them. We should have brass sponges in the next round of irons. Silly question, but are the soldering tips in the related products made for this iron? Also, is it compatible with tips for other brands? I am hoping to get a well tip for SMD but they seem to be hard to find, if at all, for certain irons. They aren't 'made' for this iron, specifically. They are made by Hakko. However, they have been tested and they work wonderfully. They are identical to the originals. Honestly, I used the 3mm bevel tip for 90% of the SMD work I've done. That and the chisel tip were the only ones I ever used. Other than 10 bucks, what's the difference between this iron and AT936B? Nothing, this is the new version. I explain it tomorrow in the product post, but this is just a cosmetically new version of the old one. The old one is discounted $10 until they go away. I only have issue with this soldering iron, but it is a problematic one The collar that holds the actual iron part to the handle is the cheapest thing imaginable and after just a few months of use its threading degraded badly. I am already having to use plumbing tape to hold it and that seems to be only a short term fix. They don't sell replacements or upgrades for that part, so it looks like I am gong to have to use a hose clamp or something to keep my otherwise awesome soldering iron running. Hi, Sorry to hear that you are having some issues with your wand. We would be happy to help you with this. Email us at techsupport at Sparkfun.com and we'll be able to take care of you. What more can I say? This soldering station does the job, isn't terribly expensive (Hakko, Weller, I'm looking at you), and is high quality to boot. Others have noted the bronze sponge-holder that keeps popping out-a bit of electrical tape (or Gorilla Tape, or pretty much whatever you please) on the edges fixes that while not being unsightly. The switch is very solid and makes you feel quite confident when you push it. Compatibility with Hakko tips is always a bonus. The Hakko FX-888D's digital temperature controls seem quite awkward, but the dial on this is simple and gets the job done. The potentiometer feels a bit scratchy here and there, but is overall quite nice and solid. The small arrow at the base of the knob is a nice touch. The wand is thin, light, and quite easy to hold (and it stays completely cool, too). The stand is a bit loose, but works just fine. (For those with cramped work areas, the angled base station is a blessing and a curse-it makes it easier to see and control, but you can't put your iron holder on top of it.) It would be nice if the light would do a PWM fade or switch between green and red, etc. instead of simply blinking on and off-this can be quite annoying to think, "Did I remember to turn off the soldering iron? The light's off, but it might just be blinking very slowly..."
It's really quite a shame that this was retired. The good news: this probably means a new revision of it is coming out soon! EDIT: Unfortunately, SparkFun relayed to me that they currently have no plans to replace this, leaving us with only two iron choices from them: the cheap iron without temperature control and the expensive Hakko FX-888D. Again, I'm quite sad that they discontinued their best midrange iron that's not too expensive while still being very useful. 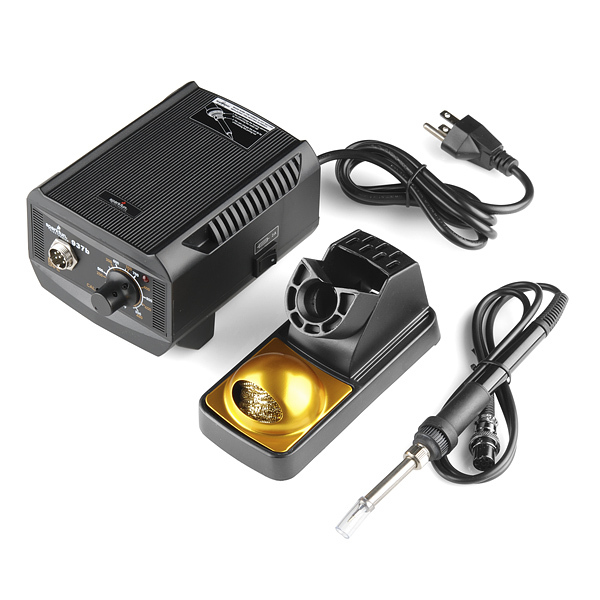 Fantastic soldering station for the price! I love this soldering station, and have recommended it to everyone I could. The soldering station is well built, seems to maintain temperature well, is very easy to use, and takes standard, high-quality Hakko tips. The iron's cable is very flexible and doesn't try to pull the iron around like a stiffer cable would. The included brass sponge works much better than a traditional wet sponge, in my experience. The stand is very sturdy and has no meltable parts. I have done both leaded and lead-free (including SparkFun Special Blend) soldering with this station, and it handles it all with no difficulty. I haven't tried to use it for difficult parts like heatsinks and huge wires yet, but I wouldn't be surprised if it struggles with thoseâit's only 50 W, after all. The iron fits very loosely in the stand, so it could be pulled out easily by something snagging and pulling its cable. I've thought about adding magnets to keep it in place. The brass sponge's roof thing doesn't stay in. I fixed this with some Gorilla Tape; someone else fixed it by putting bumps on the sides to hold it in. (minor) The stand's metal feet might scratch soft surfaces, and they make noise when sliding. I put some Gorilla Tape on them too. (minor) The power cable is not removable. (minor) The power switch is in a slightly awkward location. I'd prefer it to be on the front. (minor) There's no display of the current temperature. This is to be expected on an analog soldering station, though, and I haven't really been hindered by it. But I need another. I see the Atten 937B available on eBay. It just has the cleaning sponge. Are the parts available to add the brass sponge? Actually what I was looking for is the trim piece that holds the brass sponge. Thanks! I got this iron a few years ago. I have never had any issue with it. I have issues with the quality of the holder, but I've found that the adafru.it/1154 holder pairs wonderfully with it. Change the cord to a IEC C14 port. Detachability of the cable can make storage much nicer.